World-renowned Chef Jean-Georges Vongerichten, with his highly decorated repertoire of culinary achievements, pushes the boundaries of traditional steakhouse and Las Vegas restaurant expectations with his decidedly contemporary rewrite, Jean Georges Steakhouse. Under his expert guidance, the highest-quality meats and seafood from around the world are cooked to perfection with flavor-releasing techniques and then receive a signature Vongerichten jolt via unexpected sauces and side dishes. Alive with vibrant, often Asian-inspired seasonings, all house-made steak sauces, mustards, rubs and flavored salts deliver undeniable satisfaction you won’t find at any other restaurant in Las Vegas. 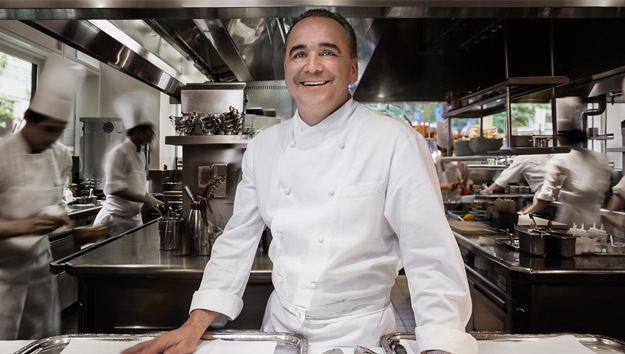 Jean-Georges' culinary vision has redefined industry standards among both Las Vegas restaurants and epicurean concepts throughout the world, thus revolutionizing the way we eat. The boldly modern space is sectioned into a high-octane lounge, elevated dining areas for maximum see-and-be-seen excitement and two private dining rooms. This masterful spin on a time-worn tradition joins beloved steakhouse touches with a chic, in-the-now Las Vegas restaurant experience, ideal for any occasion.